In this increasingly digital world, success in website content and usability is reliant on understanding our audiences’ needs through data, user research, and Search Engine Optimization (SEO). Our guest blogger, analytics expert Lana Gibson or ‘Lanalytics,’ is helping the Digital Team at Te Papa to understand our users to help improve our website. One of the first projects Lana helped us on was Matariki. Matariki is the celebration of the Māori New Year. It’s a time when people come together to remember their ancestors, share food, sing, tell stories, and play music. Te Papa hosts an annual Matariki Festival. 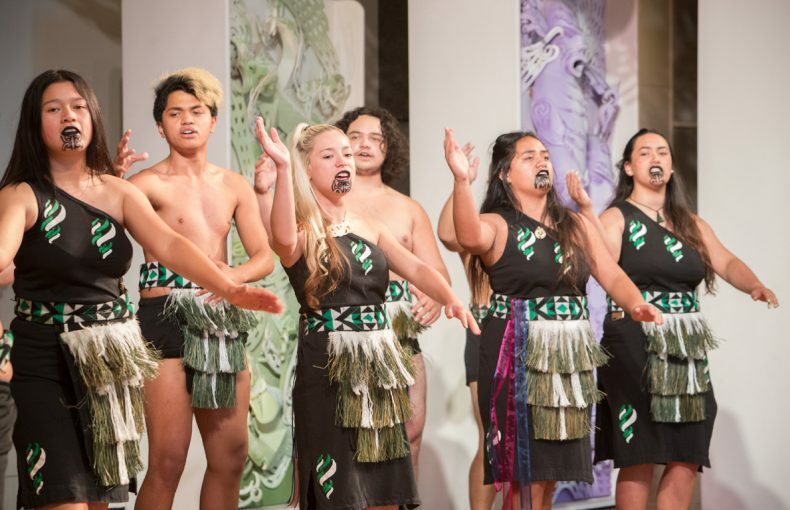 Through free cultural performances and activities, Te Papa has played a large part in reviving annual Matariki celebrations in New Zealand in the last twenty years. Te Papa also provides popular educational resources for teachers to use in their classrooms. The Digital Team wanted to increase the reach and engagement of their Matariki content, helping to foster further awareness of Te Papa’s association with Matariki. Last year Te Papa provided some Matariki content, which included education resources and festival events. In the diagram below we can see a clear spike to URLs that contain the term ‘matariki’ during the festival period. In June 2015 the pages had 21K sessions. 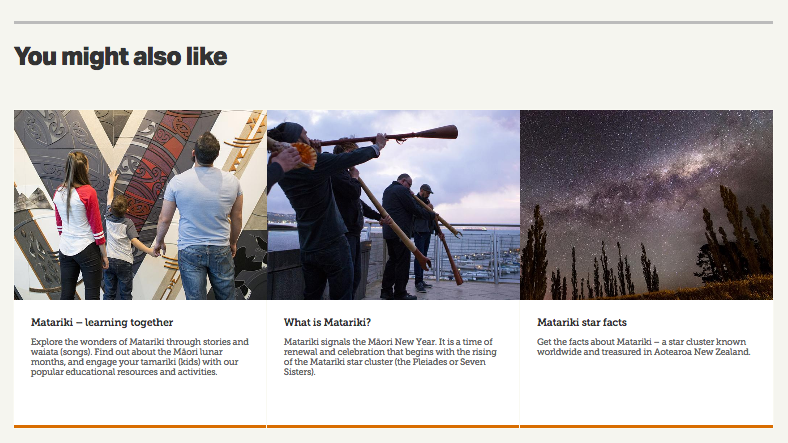 The Matariki Teaching resource page was the most popular page, accounting for 22% of all Matariki traffic. 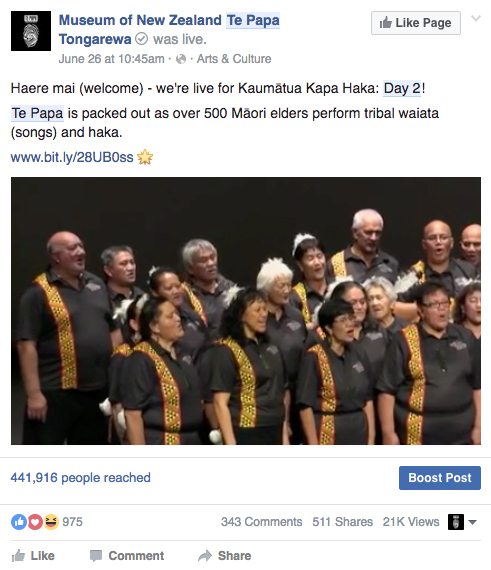 The Matariki waiata page also received significant visits. Our analytics show that we’ve increased reach and engagement for Matariki content – visits during the June 2016 peak equalled 27K unique sessions, and accounted for 38% of all traffic coming to the Te Papa website. This was an increase of 47% from last year. live-streaming performances so people can participate regardless of where they’re based. 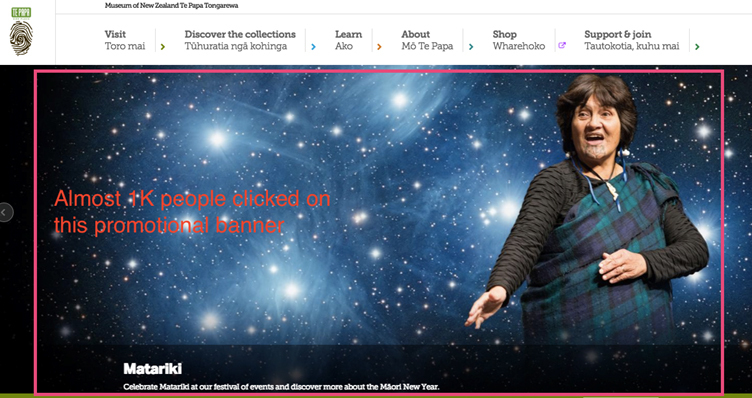 Last year, only 300 people clicked on a Matariki link from Te Papa’s homepage, but this year, our clicks increased to 1.5K! This was largely a result of the homepage banner, which received almost 1K clicks in the four week period during June. The increase suggests we’ve introduced a whole new audience to Matariki. The team wanted to create new, compelling content, informed by actual user demand, so we based new content on what people were searching for in Google. almost half of traffic to this page coming straight from Google. Last year the Matariki classroom resources page was really popular, this year it performed even better. Almost a third of Matariki traffic went to the resources page, and there were 9K downloads of the PDFs. video footage on Facebook had 21K views, 1K interactions and 500 shares without any paid promotion. Our analysis has revealed that we are reaching a broad audience of people who want to engage with Matariki at Te Papa. This includes teachers and kids in the classroom, people who want to watch celebrations while on the move, and those who want to engage from the comfort of their own home. It’s exciting to see that we’re reaching new audiences through homepage promotion, Google and Facebook. We’ll continue to look at user insights to find out how we can reach more people, regardless of whether they’re visiting the museum, and help everyone to experience Matariki festival celebrations wherever they are. I am a faciitator at Ohau Playcentre I have enjoyed and used your sites over many years always checking if there is something new, I can use with preschoolers from 0 to 6, or in informative displays for families. Thank you for the time and effort that goes into it.